Businesses continue to struggle with hiring the talented data scientists they need to manipulate their corporate data for insights, according to new research from consultant A.T. Kearney. A shallow talent pool of skilled workers to analyze big data, combined with the challenge of weeding out bad information, continues to cause nightmares for CIOs. 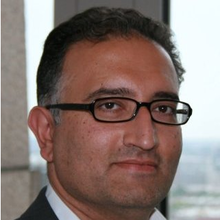 Khalid Khan, partner at A.T. Kearney. Two-thirds of companies that possess even the most advanced analytics capabilities cannot hire enough people who can generate insights from corporate data, according to new research from A.T. Kearney, which surveyed 430 senior executives. Moreover, companies will need 33 percent more big data talent over the next five years, says Khalid Khan, A.T. Kearney partner and co-author of the research. The stakes are high for attracting and retaining analytics talent. As companies digitize their businesses, it's imperative to mine the resulting data for correlations that help refine products, make processes more efficient or even identify new revenue streams. For example, the Weather Company is mulling how to predict weather patterns to help retailers divine whether or not they need to increase or reduce their inventory of water. But while business cases for big data appear infinite, the talent pool to mine it remains small. 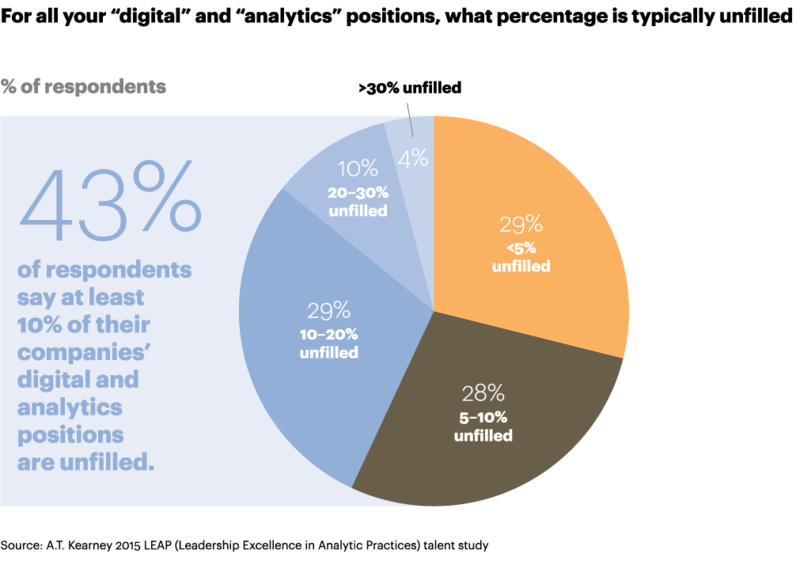 The need for analytics talent. Khan says companies should look for "trilinguals," or people with a firm grasp of quantitative analytics, digital technology and business strategy. He says respondents who qualify as analytics leaders -- those who have baked analytics into the decision-making process to predict trends that will shape the business and drive competitive advantage -- have been the most effective incultivating trilinguals who possess both business and data skills. Few such analytics hybrids are available in the corporate sector, forcing many companies to court college graduates who are technically proficient and schooled in statistical modeling. But finding qualified candidates this way is rare. They often possess the right technical analytics chops but lack the ability to derive business insights with the data. Nearly 60 percent of respondents say that the talent coming out of universities is insufficiently prepared. Seeking to meet companies in the middle, schools such as Carnegie Mellon University, North Carolina State University and New York University have built cross-disciplinary programs to help train data scientists, Khan says. But they aren't producing candidates fast enough given today's talent requirements. Enterprises face a hiring challenge. If there is a silver lining for companies that are having a hard time cultivating analytics talent, it's that most organizations are still struggling with rendering their data for analysis. It's a case of technology trumping organizational readiness. Analytics potential has grown sharply, sparked by the emergence of tools such as Hadoop and Spark, which process large amounts of data at a lower cost than was previously possible. To prepare data for processing, companies are extracting it from many siloed applications and systems. They must then normalize it, essentially weeding out bad data that skews results. It's a nontrival, time-consuming task, as Merck Animal Health CIO Dave Williams recently told CIO.com. Khan says analytics workers for one client were spending 80 percent of their time "chasing data down and then cleaning it up." He recommended the company replace over half of its analytics talent because leveraging that data for business value with the existing staff was a "bridge too far." The leaders in the study say they have figured out how to make sure their talent leaves the greatest impact on their firms. The rest are still playing catch-up or trying to figure out where to start," he says. Build a unique digital and analytics brand. 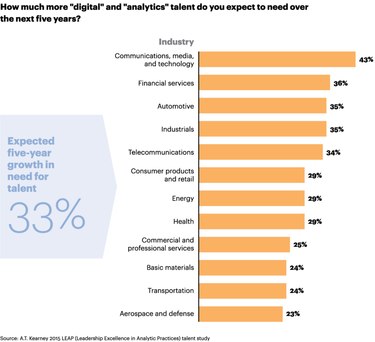 Leading firms are much less likely than laggards to hire experienced professionals, opting to groom talent from within or snare talent straight out of college to forge their own analytics brand. Given enough time to grow, these junior hires can be taught the skills necessary for their company’s business and industry. In return they are provided a progressive career path forward. Embrace rotational programs. Some firms rotate talent through different business silos, enabling employees to combine their analytical knowledge with domain knowledge to gain a stronger understanding of the impact of actionable insights on corporate decision making. Use cross-disciplinary teams to embed analytics. Other organizations designate analytics SWAT teams that work closely with business lines to embed analytics knowledge across an organization while giving the analytics talent key domain knowledge. Leaders focus on developing formal training programs, and consider center-of-excellence and shared-service models to stay abreast of emerging technologies and techniques. Build industry-university partnerships. Establishing partnerships with universities is a smart way to groom the talent for analytics positions. This could include establishing an internship program, or helping colleges shape their curricula so they are more relevant for the business world. “A good strategy will determine early where there are already good pockets of expertise, where more talent is needed, and where talent could be better used,” Khan says. Ultimately, CIOs who fail cultivate or acquire the requisite talent risk playing catch-up to competitors who gain "first-mover advantage," he says.